Heading into next week's Geneva Motor Show, Audi has released yet another new video of the A1. 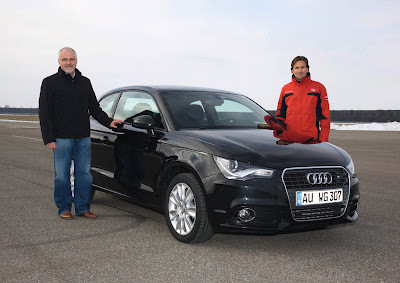 Showcasing how the A1 actually drives; DTM pilot Markus Winkelhock takes the Audi A1 for spin around the track along with Dr. Horst Glaser, Head of Chassis Development at Audi. Another factor for the agile and safe handling of the A1 is the perfect tuning of the front axle bearings, the stabilizer bars, the springs and the dampers. The rear axle features a torsion-beam suspension with the springs and dampers separated. “The car is very well sprung. It swallows up bumps of almost any size without any amplification of the motions,” says DTM pilot Markus Winkelhock when describing his impressions.